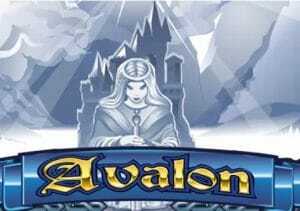 Based on the tales of the legendary King Arthur, Avalon is a 5 reel, 20 payline video slot from Microgaming. In this medieval adventure, The Lady of the Lake can deliver up to 24 free spins where your payouts can be boosted by multipliers that can top 7x. Play from between 20p and £100 per spin. If you’re not well up on your Arthurian history, all you need to know is that Avalon was the island where the famous sword Excalibur was forged and where Arthur was taken to recover following his epic battle with Mordredd in the Battle of Cammlan. There’s not much evidence of either of those incidents on the reels mind you – simply designed and set against a plain blue backdrop, symbols on show include lower value playing cards from A to 10, a goblet, a gemstone jewel, a coat of arms and a crown. 5 crowns on a payline will get you 800 coins. The mist-shrouded Avalon castle is the wild – it can land on any reel and replaces everything with the exception of the scatter. 2, 3, 4 or 5 wilds in a row pay 10, 15, 1,000 or 3,000 coins. Guinevere holding the famous sword Excalibur is the game’s scatter – landing 3, 4 or 5 of them with get you a payout of 4, 20, or 200 times your stake as well as triggering the Free Spins feature and with it 12 free spins. The coins can quickly start to flow here thanks to the multiplier which is applied randomly on each free spin. This can boost your payouts by up to 7x! Also helping you on the way is the addition of the treasure chest which is a second wild symbol. You can also trigger more free spins if the scatters land during the feature giving you up to 24 in total. Avalon is a simple video slot – the visuals look pretty dated now compared to the all singing, all dancing games we’ve become accustomed to. The haunting soundtrack is rather lovely though. It’s a similar story with the features. The free spins feature is perfectly solid and has some decent winning potential thanks to the random multiplier. The variance is somewhere in the medium range. If you’re after a slot with exotic features and swanky design, then you’ll likely find Avalon a little underwhelming and dare we say it a little boring. For basic, understated action though, this Arthurian adventure still hits the target. I recommend you try the sequel, Avalon II, which is superb.